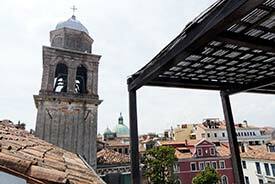 ABOVE: A view from the rooftop breakfast terrace at the Hotel Ai Due Fanali. That depends. Venice's historic center is compact, and you can walk most places unless you're staying in Mestre (on the mainland), on the Lido (Venice's beach resort), or on the island of La Giudecca. This means you can book a hotel almost anywhere in central Venice without being isolated from the sights. Are you in town for only a day or two? You'll save time, hassle, and vaporetto fares by staying near a major transportation point. See hotels near airport buses and taxis, hotels near the train station, and hotels near Alilaguna airport-boat stops. Do you have bad knees, or are you traveling with heavy luggage? If so, our "How Many Bridges to Cross?" hotel listings may help you avoid pain or annoyance. Are you arriving or departing on a cruise? Pick a cruise hotel that has good access or transportation to your ship's assigned pier. Are you on a tight budget? Consider staying at a hotel on the Lido (if you're arriving or departing from Marco Polo Airport) or in Mestre (if you're arriving or departing by train). Should I use a booking service or reserve directly with the hotel? That's up to you. Comparison shopping never hurts, but if you're in a hurry, you should know that our hotel partner--Booking.com--offers "guaranteed lowest available rates" and has more clout with local hoteliers than you do. Some people think they'll be treated better if they book directly with the hotel. Others are convinced that they're more likely to get a room upgrade or other special treatment if they use a booking service, because hoteliers know that hotel sites like Booking.com publish guest ratings and reviews. As for us, we've been treated well by hotels that we've booked through Booking.com, and we like the peace of mind that comes with using a secure reservations network. Do Venice hotel rates include taxes, breakfast, and service? Normally, rates on Booking.com include breakfast. Any exceptions are spelled out clearly. VAT is also included, and there's no extra charge for service (although you're welcome to tip the maid and porter). Please note: The city of Venice now charges a tourist tax that varies according to the type and category of accommodation. The tax is modest, and your hotel may ask you to pay it in cash when you register. How early should I reserve a room? The earlier, the better. Many Venice hotels are small (fewer than two dozen rooms), so your choices may be limited if you wait until the last minute--especially from April through October, during Carnival, or on holiday weekends. Unless you've booked a room at a special non-refundable rate, you can always cancel your reservations if your plans change. Should I consider a vacation apartment? Yes, if you'll be in Venice for several days to a week or longer. With a furnished vacation apartment, you won't have to dine out at every meal, and you'll enjoy the fantasy of living like a Venetian. On the downside: You won't have a reception desk at your beck and call, you'll need to make or buy breakfast, the most desirable apartments are often booked months in advance, and payment can be a nuisance.